Just Jingle: It's Time to Squeeze 'em! It's that time again! 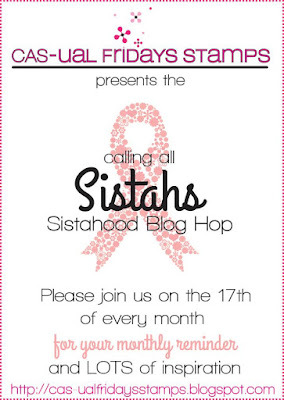 Time for the Calling All Sistahs blog hop hosted by CAS-ual Fridays Stamps! We make monthly reminder cards encouraging those with breast cancer and reminding women everywhere to do self exams! Visit the CAS-ual Fridays Stamps blog for details on prizes and how you can participate in our next hop! If you came from Penny's blog you are already on your way! If not, feel free to jump on back to the CAS-ual Fridays Stamps blog to start at the top of the list! YAY! I had a little bit of fun with my card for today! I have those cute sticky notes on my desk and I thought that was PERFECT for a reminder! It's like a little calendar reminder! Totally fun! I stamped using sentiments from the Calling All Sistahs stamp set. Don't forget that a portion of every one of the Calling All Sistahs sets is donated to finding a cure for breast cancer! 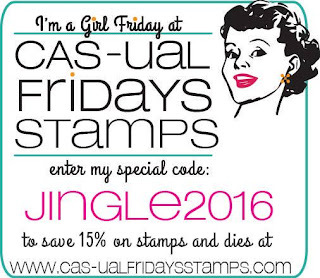 AND... you can even get a discount on those or ANY stamps in the CAS-ual Fridays Stamps store by using the code JINGLE2016 at checkout! 15% off your order! WHAT?! I know, right? Reminding a friend to check herself AND an awesome discount? It just doesn't get better than that, my friends! Your next stop on the hop is Claire's blog! I love how you card looks like a bullentin board with that very important reminder on it! Fun card design with the sticky note, arrows and hearts.